Welcome to October! This month at d.trio we’re jumping on the biggest craze in the land this time of year and PUMPKIN SPICING EVERYTHING. Stay tuned for videos, recipes, weird image filters, and pumpkin flavored marketing of all varieties. Feel free to chip in and send us your favorite pumpkin spiced ideas. Four steps to better brainstorming. It makes sense in theory. Coming up with fresh ideas is hard. And we all know that misery loves company. The coffee and donuts don’t hurt, either. Problem is, brainstorming has its faults. Quite a few, actually. And while it might have been a revolutionary idea when Mad Man Alex Osborn invented the process back in the 1940’s, since then, we’ve learned that while a group can be good for some things, like building a house or forming a cheerleading pyramid, when it comes to generating breakthrough ideas, the group dynamic falls short. Group brainstorming leads to what’s referred to as groupthink. Instead of original ideas, people tend to latch onto what’s already been said, thereby squashing creativity like a mosquito. In a group setting people tend to seek praise and approval. Nobody wants to looks stupid or challenge the boss. This stifles free thought and originality. Even though proper brainstorming technique involves suspending judgment, it’s only human nature to seek the approval of others. As a result, the truly unique ideas often die a quick death, never being said for fear they may sound impractical, ridiculous, or just plain dumb. Group brainstorms encourage lazy thinking. Because responsibility is diffused among all the participants, people tend to work less hard to solve the problem. If one person doesn’t come up with a solution, somebody else will. No biggie. Which makes group ideation sessions less productive than individual ones. In most brainstorming sessions, the most vocal and outgoing ones end up doing most of the talking. The louder people are often more pushy and persuasive, giving their opinions more weight in the group. But many creative types tend to be introverts by nature. Of course, not everybody comes up with ideas the same way or thrives in the same environments. And so the ideas of the quieter ones often go unheard, leaving them out of the process. Clearly, traditional brainstorming isn’t all its cracked up to be. So what’s the solution? Have people start out by spending time thinking of ideas individually (brainstorming actually works much better as an individual activity than a group one). This way, the initial idea generation phase will exist independent of the group dynamic, giving everyone a fair chance to approach the problem in the way that’s best for them. Another advantage to coming up with ideas individually is that our brains work best that way. The stressful, think-by-the-seat-of-your-pants environment stifles real creativity. Science has proven that the best ideas come from relaxed brains—especially ones that are focused on something other than the problem at hand. Which is why you often get your best ideas on the treadmill—not seated around a large conference room table with twelve pairs of eyes bearing down on you. Once everyone’s had a chance to consider the problem, put everything up on the wall anonymously. This allows the solutions to be evaluated equally based on the ideas themselves rather than who came up with it. It also gives every idea—and every employee—an equal voice. It spares the individual the stress of looking foolish. And since nobody knows who did what, it’s easier to evaluate the ideas on their own merits rather than on office politics and personalities. Once the ideas are up on the board, have everybody come together to discuss what’s there. Employees can evaluate the ideas more fairly and work together to develop certain ones further. Any time there’s a group, there will be a group dynamic in effect, but following this approach of working both individually and together will lead to much more productive sessions as well as generating a higher quality and quantity of ideas. And as for those donuts, it’s probably best to skip those, too. With back to school underway and lots of talk about learning, I have been reflecting on how marketing has changed, like education, from a lecturing format to information sharing. This is what we do as marketers, if we do our jobs well, we educate. Particularly now as content marketers. We want to make sure our audience gets the relevant information they need in order to do their jobs better, or improve their lives. We’re not curing cancer, but we’re sharing information that we find compelling, or maybe some life hacks that just make things simpler. Marketing isn’t about shouting the loudest anymore, it’s about whispering – look at this great thing that I’ve learned – and sharing it with the world where it can do some good. If we’re lucky enough to do the things we love to do and do them well, we want to share them, and that makes it all the more enjoyable. I hope you find the information we share interesting, helpful or enjoyable and we’d love to hear your ideas for content that you’d like us to share, because we like being educated too. Our 2014 higher ed survey results are here! Over 180 college admissions and marketing professionals from 39 states took part in our annual marketing survey. Their responses tell us they’ve expanded their digital toolbox to the saturation point. However, mastering the challenges of channel mix, tactical execution and analysis is another adventure. To find out more, visit our survey snapshot. September means fall and back-to-school for most but, for those fashion-obsessed fans out there, September also means the arrival of the (arguably) most iconic print publication ever to hit the press: VOGUE. Rumblings about this year’s Semptember issue selling out had a few of us at d.trio scrambling to the store to grab our editions. But, it also got us thinking, why do we still “j’ADORE” print? “Digital Detox” people increasingly want to unplug. We spend all day staring at computers, iPhones and other mobile devices. Reading a print piece versus something on the screen of a tablet is a welcome reprieve. Prestige: Consumersperceive there’s something more permanent and credible about a print piece compared to their digital counterparts. Ironically, the low-cost efficiency that makes digital so appealing to publishers, can also make it appear fleeting. Greater ROI for advertisers: GFK, a reputable polling and research company who specializes in measuring return on investment, released results in 2014 suggesting that Print Advertising is where advertisers might get the most bang for their buck. The study reports the performance of 5 media channels: news, print magazines, radio, TV and online banner ads. And the findings suggest that print has the highest ROI at 120%*… It shocked us too. Of course from a bottom line perspective, digital issues are still preferred by the publisher. Digital gives magazines the ability to change course quickly, respond quickly, and digital issues are clearly more cost effective. So why, after years of the digital boom, is Vogue selling more issues than ever? Simple. Consumers and advertisers prefer it. 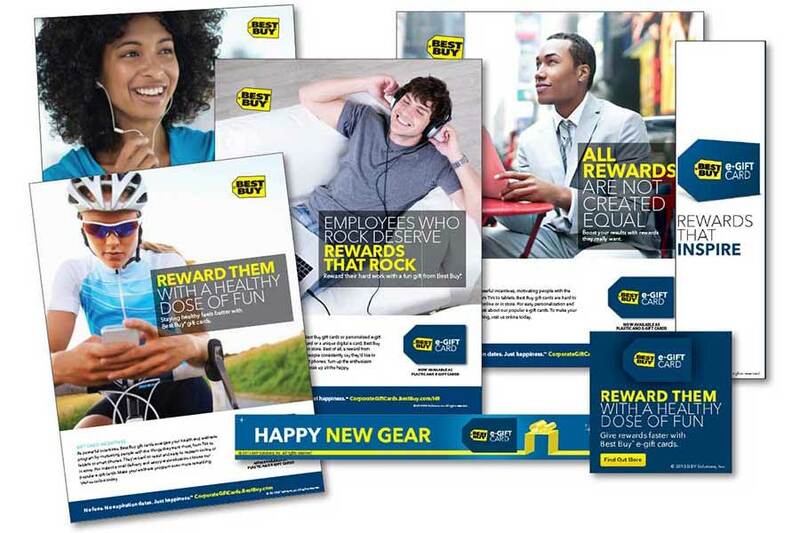 Working with a range of industry verticals and audiences, our challenge is to create a fresh new look and message for Best Buy’s benefit-loaded B2B gift card program. Our approach is audience driven; both creative and copy versions are tailored to relevant touch points for each publication or vertical, from HR professionals to corporate incentive buyers, our goal is to enhance the aspirational and fun attributes of a Best Buy gift card. d.trio is producing creative for a wide range of print and digital formats as well as advertorials.